This story from the Mueang Nakhon Ratchasima District of Thailand is a wonderful example of how great people can be when faced with animals in need. 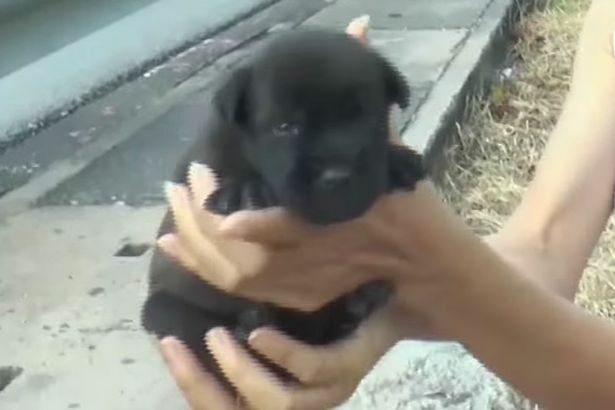 A one-month-old puppy became trapped at the bottom of a sewer hole and was completely unable to get out. The pup’s mother and their guardian could do little to help the small dog and were left beside themselves with worry. Luckily, a kind police officer witnessed their struggle and stepped in to help. Together, the police officer and the dog’s guardian tried to coax the puppy out with kind words, sticks, and treats but the little guy was frozen to the spot. That was when 54-year-old police officer Yak Srivijaya took it upon himself to go into the sewer hole after the stranded puppy. The puppy’s mother and pet parent stood by with bated breath and rattling nerves. But thankfully their prayers were answered when the officer emerged with their baby. The puppy was a bit shaken but otherwise okay. Don’t you love stories with happy endings? We know we do! Responses to "Kindhearted Police Officer Crawls Into a Sewer to Save a Trapped Puppy"
They love their puppies, too bad they can't get the adults altered. Just too bad.